Now you can achieve both functions while maintaining the clean look that shades offer. Hunter Douglas, the leader in innovative window treatments, has designed the unique Duolite™, system, which controls day and night levels by using two separate fabric panels to provide maximum light control. Or, rather, Duolite™ is two shades in one. You can get the unique option on the following Hunter Douglas products: pleated shades, Applause® Honeycomb Shades, Alustra® Duette® Architella® Honeycomb Shades, Duette® Architella® Honeycomb Shades, and Duette® Honeycomb Shades. You’ll note that pleated shades and honeycomb shades are the most popular here. Honeycomb because of its energy-efficiency—its honeycomb construction traps hot or cold air at the window and provides excellent UV-ray protection. 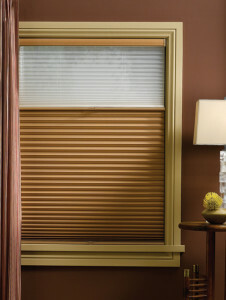 Pleated shades are popular because they offer modern colors and patterns that will add charm and style to any room. With pleated shades, you can select a fun opaque fabric for night with a complementary sheer for during the day. Today, Duolite™ provides you with the ability to control light and privacy with the ease of two products in one. The need to add an additional window treatment such as draperies or second window covering product is now not necessary. Innovation drives Hunter Douglas to come up with new ways to solve challenges. Our Hunter Douglas window products add unique luxury and style to any room while also providing advanced solutions to everyday needs, such as managing light, insulating the window, enhancing child safety, absorbing sound, and much more.